Dr Serge Liberman OAM passed away in December 2017, aged 75, from motor neurone disease. Born in Uzbekistan in 1942 to Polish refugees, Serge Liberman came to Australia as a child with his parents in 1951. He graduated in Medicine at the University of Melbourne and subsequently became a general practitioner for forty-five years. His love of literature and writing began in adolescence. Alongside his medical practice he wrote fiction, was literary editor of a Jewish newspaper, a member of editorial committees of several literary and historical journals and a contributor to publications and anthologies in Australia and overseas. He produced six collections of short stories, receiving the Alan Marshall Award three times and the NSW Premier’s Literary Award. Liberman compiled the Bibliography of Australasian Judaica, the updated and annotated edition of which was published in 2011. In 2015 he was awarded the Medal of the Order of Australia (OAM) for his contribution to Australian literature as an author, historian and scholar. 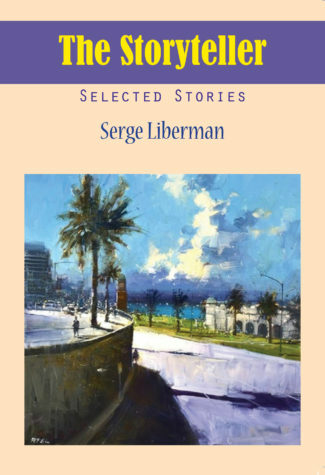 His latest collection of selected short stories The Storyteller – Selected Stories was produced during his illness, with the assistance of literary friends, and was published posthumously in 2018. The Storyteller is available from Hybrid Publishers, Australia. Reprinted 1982, 1984 & 1988. Seventeen stories in which the author adopts various roles – immigrant child, doctor, deserted wife, tourist, jester – to tell of adjustment and maladjustment of migrants in a new land; of conflict between the generations; of individuals and communities doomed by time and by their own natures; of obsessed artists and rootless philosophers; and of impossible friendships and impossible loves. Published in 1983 by Phoenix Publications, Brisbane. A professor of medicine emotionally entangled with a patient, a business magnate in pursuit of immortality, poet-survivors from Europe, an abandoned actress, outcast children, bewildered migrants, revisited friends — sixteen stories telling of people ever in search, in search for love, closeness and consolation, and for values and meaning in a world that sets limits upon all that a man may know, attain to, hope for and believe. A professor of medicine emotionally entangled with a patient, a business magnate in pursuit of immortality, poet-survivors from Europe, an abandoned actress, outcast children, bewildered migrants, revisited friends — sixteen stories telling of people ever in search, in search for love, closeness and consolation, and for values and meaning in a world that sets limits upon all that a man may know, attain to, hope for and believe. Published in 1986 by Fine-Lit. Philosophers, visionaries and poets, and survivors, doctors, children, adolescents and mimes among a host of others discover God, love, truth, terror, identity and self as far afield as New York, Venice and Curacao, no less than at home, at St Kilda Beach, at a New Year’s party, or under a circus-top, in a surgery or along the common thoroughfare – sixteen more strong, sensitive, penetrating stories by a writer recognised as a disciplined master of his craft. Is There a Jewish Literature?